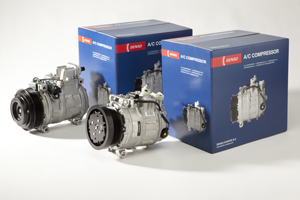 Denso has extended its air conditioning compressor range by adding a further 29 new references. The Japanese parts supplier has introduced the new products in order to increase its grip on the air con market, by extending its offering to the independent aftermarket. It sees new references for the BMW 1-, 3-, 7-Series and the X5, the Mercedes M- and S-Class, Subaru Legacy and Outback, Toyota Yaris, Auris, RAV 4 and Land Cruiser, Chrysler, Jeep Cherokee and Hummer H2. Each of Denso’s compressors are sent as complete assemblies ready for technicians to fit, including with the right specification and amount of oil in the unit, and its 479 part numbers covers all types of compressor including, the reciprocal, rotary and electrical variations. Martin Pring, Manager of Denso Aftermarket Sales, said: “These new references demonstrate our continued investment in providing the widest range of air conditioning compressors in the automotive aftermarket. Thanks for the tips. Very good. The potato launcher should be continually set up for when “man” tries to use compressor!